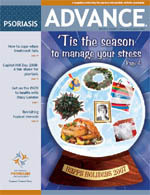 Check out our Latest story in the October-NovemberIssue of the National Psoriasis Foundation. Please look for our article in the up coming issue of advance. about Puraderm Laundry. Our Detergent does have “surfactants”.